My name is Reilly Hoagland, and I am 10 years old. I live in Toms River, NJ with my parents, my 6-year-old sister Melanie (she doesn’t have CF), and my dog Ryder (yes, he is named after a former NJ Devils Hockey player). I was diagnosed with Cystic Fibrosis when I was 4 years old. I have been pretty lucky to have not been in the hospital since I was diagnosed with CF. This year, I even got perfect attendance for the first two quarters of school. 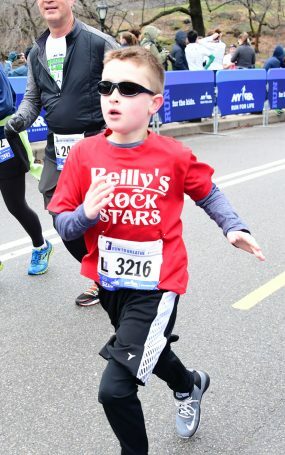 My team Reilly’s Rock Stars participates in lots of activities for CF. We have participated in the Boomer Esiason Run to Breathe every year, since 2012. I have run the 4 miles myself for the past three years. I enjoy surfing and going to the beach during the summer, luckily we live really close. I have played travel soccer, lacrosse, karate, and flag football. But my real love is hockey. It doesn’t matter what kind – knee hockey, street hockey, or ice hockey. I just love hockey. I have been playing since I was 4 years old. I currently play for the Toms River Blackhawks and the South Jersey Selects. I love the NJ Devils and enjoy going to as many games as I can. I also love to travel with my family, but hockey tournaments and staying in hotels with my friends are the best. Playing sports motivates me. I want to be as strong and healthy as I can so I can participate and keep up with my team. Everyone needs to exercise, but people with CF need to exercise even more to stay healthy and keep your lungs clear. Taylor Hall, because he plays for the devils and is a good hockey player. Keep running, everyday. Always be positive and never get down on your self. It is important to do your vest and treatments to stay healthy.